Imagine you have a website but know nothing about SEO. But you’ve heard about Yoast SEO and people have told you it’s a great tool for effortlessly optimizing your site and its pages for Google, Bing, and Yandex. So you install the Yoast SEO plugin or the Yoast SEO extension and follow the instructions. Within a week, your website will be right at the top of Google – or will it? No. To be honest, it’s not that simple. Our plugin helps you to optimize your website for search engines, and while it does that well, it still needs your input. This beginner’s guide to Yoast SEO explains the basics of SEO as covered by our plugin. I’ll take you through the steps taken by every user trying our plugin for the first time, and help you optimize your site in the process. Before we start, I should point out that this isn’t a guide to every single detail of our plugin. I’d just like to show you some important things I think you should use or configure. As our plugin has quite a lot of settings, it’s good to know which you should configure first. The configuration wizard guides you through 12 steps that help you configure our plugin to suit the needs of your site. Even if your website has already been around for a while, you should still use the wizard to make sure you don’t miss anything. Each step includes questions, the answers to which will determine particular settings. There are also videos included in the wizard to explain even more options. But there are so many more settings in our plugin’s SEO controls! Of course there are many aspects to SEO and a lot more to take control of within the plugin. But the configuration wizard, combined with our SEO knowledge, means that we can configure most of the plugin’s general settings for you, so, you can focus on what’s most important – your content! You’re going to find the Yoast SEO box very useful. As you can see, there are a couple of tabs here. In the first tab you can insert the keyword you want to optimize the page for – the focus keyword. For this post it’s: ‘Beginner’s guide to Yoast SEO’. This tab also includes the SEO analysis. The second tab is marked ‘Readability’.We’ll get to that later. Under the tab where you can insert that focus keyword, we’ll tell you if you have used that focus keyword the right way in that specific post. If you want your page to rank for a specific keyword, you need to write at least 300 words on the subject, or risk it being considered a ‘thin content‘ page by Google – and you want to avoid that. Add a meta description that includes the focus keyword. People searching that term on Google will see this in search results, so make it enticing to click on. You want to make clear right from the start what the page is about, so start adding the focus keyword from the start. Add images to create a better experience for your users. Use the focus keyword in the ALT text so that Google can relate that image to the keyword. We want sites to link to other websites as well, as this opens up the web. Link to other websites that back up the points in your blog posts, or provide further information. This will help Google work out which websites relate to each other on what subjects. A short page title allows you to add a trigger for a visitor from Google to click to your website. Repeat your focus keyword in your URL. This makes it clear – even out of context – what your page is about. And Google also likes seeing it in there. You should optimize a single page for a certain keyword – not an entire website, so don’t create pages that compete with each other! Yoast SEO will warn you if you write more than one post about the same keyword. A simple solution is to use a variation or a long tail keyword. 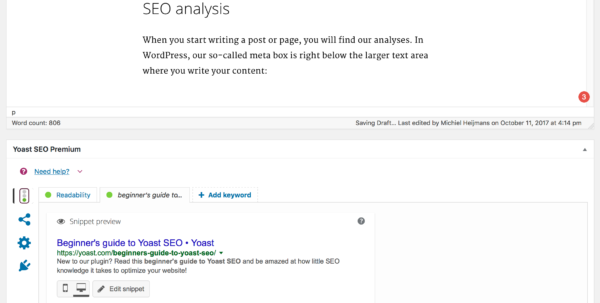 In Yoast SEO Premium, you can now optimize for keyword synonyms as well. And we plan on releasing many more features in the upcoming period, so stay tuned. As well as all the checks, we provide an editable snippet preview, which shows you how our plugin displays your page to Google and other search engines. Since SEO is one of those areas where content is indeed king, we also provide a convenient readability analysis for you. That’s because we understand not everyone has the skills to easily create readable content. I laughed out loud when I heard that someone thought it would be a good idea to use our readability analysis to analyze the readability of books and even Hamlet’s first soliloquy by William Shakespeare. Oh, the time wasted! If Hemingway was around today and writing a blog, he’d probably love our readability analysis. It would allow him to translate his offline writing into nice readable web-friendly content. We have a post called “Yoast SEO hates my writing style” that goes into these common misconceptions. If you’re going to write website content, you need to understand that online and offline writing are two different things. While we take the time to read, digest and daydream about all the great stories we read in books, we tend to scan, process and use the things we read online. Reading a book like Hemingway’s ‘The Old Man and The Sea’, we feel the man’s frustration and motivation as he struggles with a marlin for days in his tiny boat on the lonely sea. 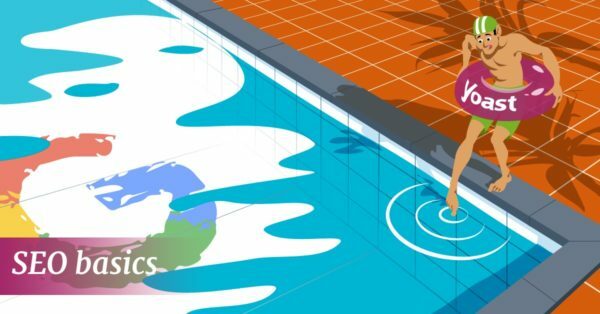 But, as this beginner’s guide to Yoast SEO is on a website, you probably just scanned it to see if there’s something here you didn’t know already. This post isn’t a page in a book. It’s information for you to process like most online pages are and we wrote our readability analysis with that purpose in mind. As you may know, Yoast is based in the Netherlands, where the law requires that the text on all government websites should be at B2: Upper intermediate level. It’s a rule that makes sure that every citizen, regardless of the level of education, can read and understand the information on these websites. We aim to help them with that. Our readability analysis works for websites in English, Spanish, Dutch, French, German, and Italian by the way. Use of headings and subheadings so that people can scan your pages faster. Headings help you group topics, which makes it easier to process them. 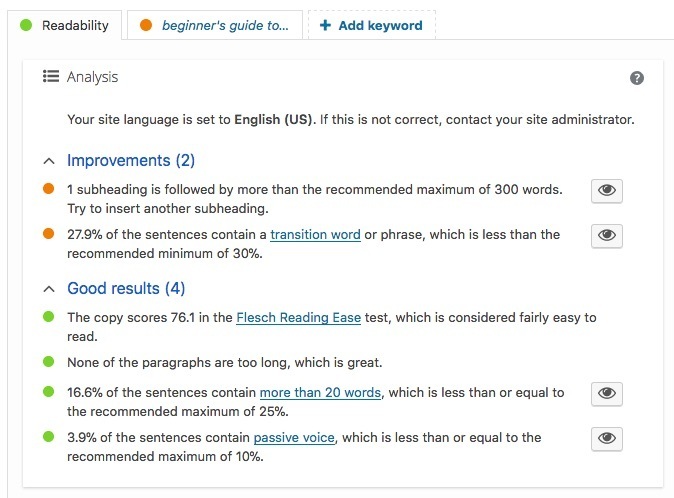 Readability score: the Flesch Reading Ease test makes sure every reader can understand your writing. If you are writing for a more educated audience, a lower score is more acceptable – it’s a guideline, you decide how strictly to follow it. Use of transition words to help improve the ‘flow’ of your page. They send a signal to your visitors that something is coming up and prepares them for the next sentence. You’ll find that the recommendation of using transition words in 30% of your sentences isn’t that hard to do. Paragraph length: long paragraphs in an online article are more difficult to understand as readers find themselves lost in all the words. Bite-sized chunks of text are easier to process. Sentence length: while in a book you can stretch a sentence over half a page, shorter sentences are that much easier to read online. We use 20 words as a target length. Use of passive voice: passive voice distances you from the reader, while active voice is much more engaging. It’s almost impossible to write a ‘natural’ article without any passive voice at all (IMHO), which is why we ‘allow’ 10% passive voice in our analysis. If you want more insight into how we decided on all these criteria, see Content analysis: methodological choices explained. Of course, there is so much more you can do with Yoast SEO. For example, in the Search Appearance menu you can adjust how your site appears in search engines. And in the Search Console section, you can connect your Google Search Console account to Yoast SEO so it can find and fix errors. In Search Appearance, you can change how our plugin sets up, among other things, your titles and metas. I want you to have a look at that section. There’s no need to change anything, but I just want you to know it’s there and realize what you can configure. The reason why I’ve drawn your attention to this is that I want you to know it’s there, so you don’t have to look for it in the future. This is why your titles are shown like this in Google searches. You can find the Search Console settings a bit further down the SEO menu. Now, if you have set things up with our configuration wizard, you have probably already connected Google Search Console to our plugin. If you haven’t done that yet, you can do so at any time using the Search Console section. That’s it for our beginner’s guide to Yoast SEO. Now your website is ready for Google, you can get on with adding awesome content! 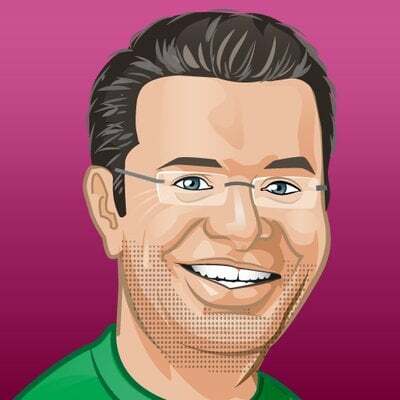 Is the Yoast SEO for blog postings only? How does it apply to product pages? Thank you very much for sharing this, i was just looking for some inspiration and found this. I was looking for these tips. Thanks for sharing! 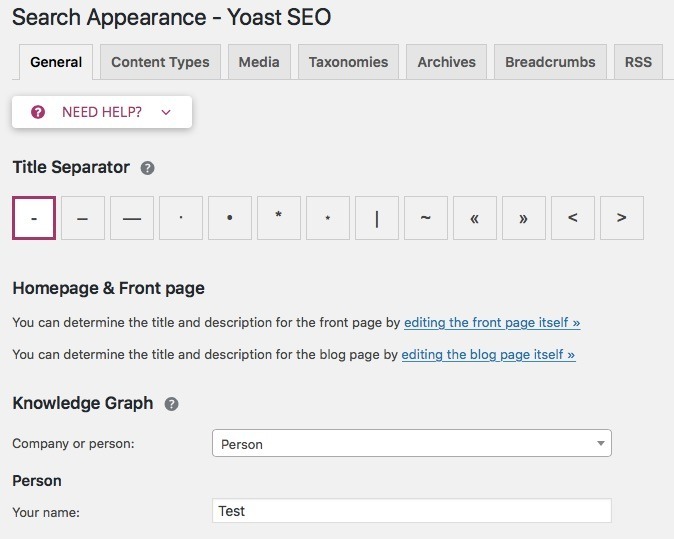 Yoast made it easy for new bloggers to make their content SEO friendly. Thanks for this awesome guide. Thanks for sharing beginner guide of Yoast and since 2015, I am used, Yoast plugin in my 10 websites. Is there any way to add more than 1 keyword without the Yoast pro? Hi. Of course, you can always add multiple keywords or relevant key phrases to your text. But that’s fairly time-consuming and you won’t be able to optimize it perfectly. So the multiple focus keyword feature in Yoast SEO Premium is a great addition to your toolkit. Very useful, thanks for sharing this information. Do you think it is possible to become a pro with those tutorials from Yoast? Thanks for this beginner’s guide. I use Yoast for more than 5 years and this plugin is always evolving in the right direction. I was wondering about AMP. Maybe you should speak about it since it’s becoming more and more important as ranking factor. I noticed that you have an addon for Yoast, which make it even easier to use. Hi Murat, thaks for your comment. We do have a number of articles about AMP and will keep you updated via our site or newsletter about developments in that area! hi Michiel We used the code %% title %% %% sep %% %% sitename %% from the beginning up to now. Do we need to change? Hi Nexvan, In most cases, just the page title works fine indeed. Only if you have very long posts divided over multiple page the page number is needed. very informative article.if we implement these steps it will ranks your page on google. Thanks Michiel for sharing with us. Great article with great information!!! Hi Yoseo, Thanks for sharing our post! By following those steps I could achieve first rank in google. The position is still unbeatable from last 4 year. Thanks for making great plugin.